Advances in Liquid Crystals, Volume 3 presents some of the applications of liquid crystals, particularly those related to lyotropic and thermotropic liquid crystals. 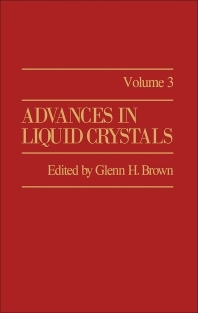 The six articles in this volume cover the development of the theory of electrohydrodynamic properties of liquid crystals; study of lyotropic liquid crystals in the area of surfactants; liquid crystals and foams; the development of ultrasonics in liquid crystal media; and the field of liquid crystals in chromatography. The book will be invaluable to materials engineers, inventors, physicists, and researchers in the field of electronics.